Four years after the “big bike race” made the topic a point of debate in Richmond, the city is on the verge of adopting new rules that would make short-term residential rentals permissible. The city planning department is soliciting feedback on a draft policy to regulate nightly rentals of rooms and homes such as those marketed through websites like Airbnb, FlipKey, HomeAway and VRBO. The proposed rules were presented to the planning commission this month and are being circulated for review before going to the commission and City Council for potential adoption. We’ve discussed short term rentals on the site before, but what do you think? Do you see yourself being ok with short term neighbors? 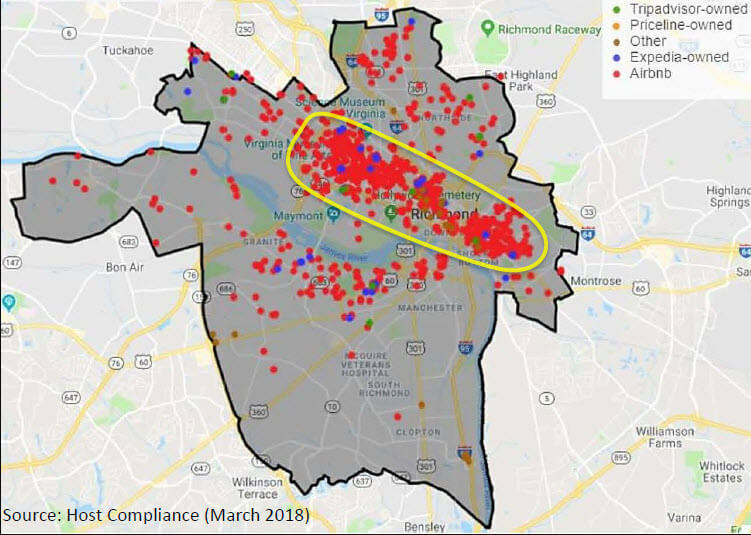 Technically, short term rentals are not allowed at all right now and these permits would potentially set a general framework on how to regulate non-compliant operators. If you’re interested in getting your opinion out there, you can complete this survey. Just what we need, more government regulations. It’ll end up being another tax revenue the city will squander. Why? And how much will this cost? Unnecessary government oversight. 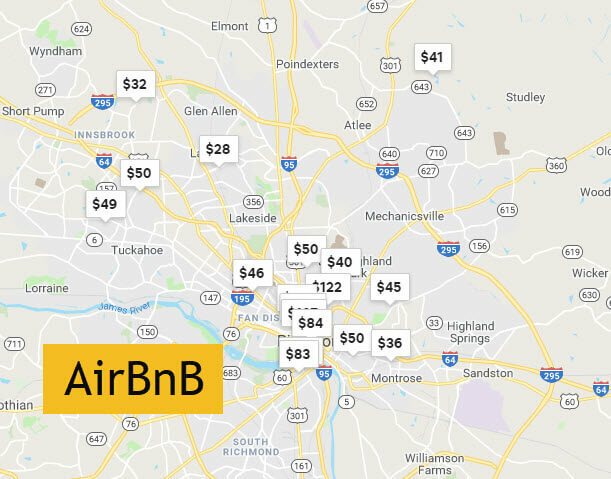 I support legalizing AirBnB and ahort term rentals in the Richmond Va region. These rentals offer a great alternative for family groups that want to travel in a region together. These rentals are already outright banned in the city and I don’t see a whole lot administration and monitoring happening if they became legal. Especially not 300$ worth per rental. I do NOT want to live next to a short-term rental. If a “neighbor” ended up doing that permanently, I would move. I really like getting to know my neighbors and have that safety/community around me. To have constant total strangers is just too much of an unknown. AirBNB is awful for rent values too – will make the city more unaffordable. This is a TERRIBLE idea. Properly monitoring, inspecting and regulating this will cost way more than $300 per unit. Which means either the City will once again go over budget or they will just jack up the fees down the road and pass the costs onto the regular folks trying to make ends meet by renting out spare rooms in their houses. Either way, it’s a losing proposition for taxpayers and residents. No offense to anyone at Richmond City, but how about getting the tasks already on your plate streamlined to some basic level of competency (like issuing permits on a timely basis) before creating more bureaucracy? This is an all-around terrible idea. @Partick Garrett: You are 100% spot on. This is nothing more than meddling with people’s property rights so as to raise revenue for a government that cannot control spending (—like giving cheeseburgers to a kid who has a weight problem). Initially concocted in connection with the big bicycle race in 2015, but shot down by the Planning Commission on the grounds it would be too hard to enforce. Now, our Planning Commission has figured out it can hire an outside contractor to do the enforcement and pay it with the egregious $300 bi-annual fee. Unforeseen consequences: tourism is harmed, property owners who need the extra cash are penalized, and overall bad taste in citizen’s mouths in regard to their city government. I agree with the sentiments ecpressed so far on this post. This would not be enforceable and $ 300.00 is absurd. This semells like the stop bus sign scam the City thought was going to make money. @G – Nothing in the proposed ordinance would address your concern. Nothing. Whether the City passes this or not, your next door neighbor can still turn their house into an AirBnB rental. This ordnance is simply a way to raise revenue. And if anyone thinks that charging folks $300 for the AirBnB “privilege” would stop a renter from having a big “crashing through the floor” party . . . well, I have a bridge up in Brooklyn I’d like to sell you. I have a short term rental across the street and one two doors down. These houses are used exclusively for short term rentals. There are at least three different sets of people in each per week. Most of the renters are respectful of the neighbors, but occasionally, they are not. Also, I like knowing my neighbors and being friendly with them. If people want to rent their homes on occasion, like when they’re out of town, I’m fine with that, but I’m not a fan of using their homes exclusively for short term rentals. Daniil Kleyman yeah another mess of messes to deal with. One consequence of short-term rentals: investors buying properties and then residents can’t afford to buy or rent. It’s happened in places like Dublin, Ireland. Why is this needed? There are plenty of hotels and motels to accommodate travellers to the city. 3) Inspected by the city for such occupancy safety on a regular basis. Also, the “owner” needs to be on the premises and not rent out an entire unsupervised house but only rooms or a floor. We saw recently what happened with a house rented out unsupervised when the floor caved in during a rowdy party. To me, a BnB is a Bed and Breakfast. Not, Bed and Get Your Own Damn Breakfast. It is supposed to be only a “bed” and “breakfast” cooked by the proprietor for their guests in a boarding house like atmosphere… meaning they are on the premises. At least that is how traditional BnB’s have been for 150 years or more. People will also need to check with their homeowner’s insurance for such allowances. I think I’d be in favor of a sliding scale fee based on the number of rooms available to travellers or number of travellers an Airbnb host says their place can accommodate. To me, that would mitigate the pain for someone who is offering a private room in a shared house at $40-50/night vs. someone who is offsite and offering the whole place for $100-110/night. If the per day cost of a whole-house Airbnb differs significantly from the prevailing “per day” rental rate, then there’s a strong incentive for investors to offer properties on Airbnb, rather than to residents, leading to the issue that @13 raised. My property taxes have doubled in the five years ive owned my home. I rent rooms in my home and have cornered the market on mother-daughter weekends, races, graduation, and traveling nurses. As i get older, this will probably be the only way ill be able to cover my nut and age in place. Tax the assholes who get $3-4k/mo. not me. I act as and adjunct conceirge for the city and guide my guests on where to go and what to eat. You’re welcome, Richmond. The beauty of AirBnB-like companies is that people can vote with their dollar. Bad rental? Leave a bad review. There is no need to create more taxes in Richmond, especially for something like this. If you are a homeowner, you should be able to rent your house how you wish with existing laws applying. If you wish to rent your apartment, that’s between you and your landlord. Allow AirBnB-like rentals. Don’t charge a fee. Yeah cause thats what we need… government telling us more and more what we can do with our own property. So many statist in this thread. @20 and all you other libertarian types – i would much rather have an elected body of our representatives making decisions that affect the quality of life in our neighborhoods than a total free for all. It’s good to have general guidelines in place so random yahoos next door don’t turn my home into a nightmare. I’ve never understood why you don’t understand that “the government” is just a collection of ourselves. Not something apart and different. Just us, ruling ourselves. They/we are taking the decision slowly, encouraging feedback. For some reason, at times, I feel like we have a bunch of anarchists amongst us. They don’t believe in rules and government, even when they are for the good of a community and its citizens. Again, a B&B is “Bed and Breakfast’. How do you provide a homecooked breakfast to guests to fulfill the second ‘B’ if you are not on the premises? And once again, that your homeowner’s insurance covers this in case a guest gets hurt on your property or becomes sick, or worse, dies. You recognize that AirBnB is a brand, not a service promise, right?